The Pennsylvania sand tart seems to have several European sources, including Sandbakelse, Norwegian sugar cookies that date to the mid-19th century. These are pressed into tins, and the baked cookies are sometimes filled with preserves or fruit. There is also a German cookie called Heidesand, or “heath sand.” But unlike sand tarts, it contains no egg and so is more like a shortbread. Another possible sand-tart relative is the sable (French for “sand”), found in France’s Normandy region. Interestingly, there is also a cookie in the American South called a sand tart, but it is thick, crescent shaped, and rolled in confectioner’s sugar. It doesn’t seem much like the other “sand” cookies. Beat the butter and sugar together; add the yolks beaten to a cream, then the whites well beaten; mix all well together, and add the flour. Roll out on a baking-board, cut with a round cutter, and bake in a moderate oven until a light brown. Some sand-tart recipes (including my grandmother’s) contain much more butter than this one, in the tradition of the Norwegian sandbakelse. I tried Rorer’s recipe, and the cookies were good but not as rich and crumbly as my grandmother’s, probably because there is half as much butter in them! 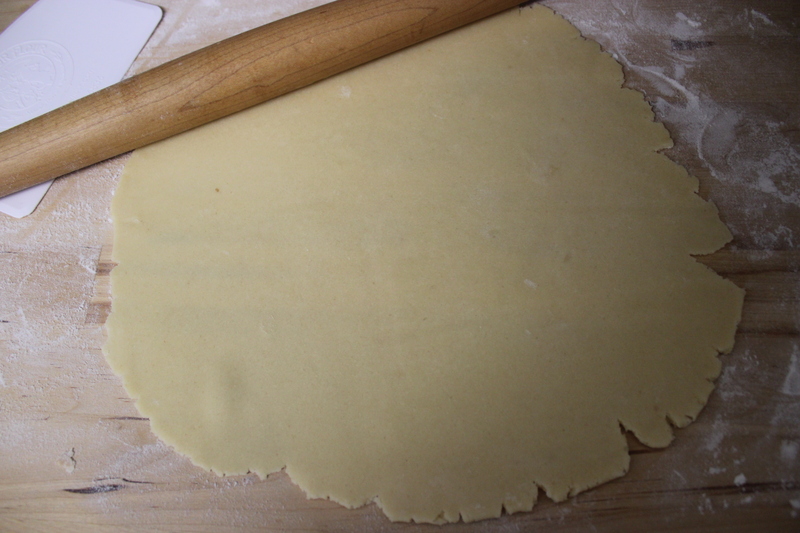 Rorer’s dough was less sticky, however, and so easier to roll and cut. The more I researched sand tarts, the more variations I found — in relative amounts of butter, flour, and sugar, and in types of sugar (some were made with brown or confectioner’s sugar). Most recipes called for topping the cookies with cinnamon sugar, and some with nuts as well. Fannie Farmer’s 1896 Boston Cooking-School Cook Book suggested three blanched almond halves on top, a finishing touch that is still common today. My grandmother used a cotton pastry cloth and rolling pin cover, but I never really got the hang of those. I use a tapered pin, and flour it and the board frequently, although you need to be careful not to work too much extra flour into the dough. I tried rolling the dough on a silicone mat to see if it would stick less, but I don’t think it made a difference. Just keep your dough cold and try to work quickly. The recipe below is based on the one used by my grandmother, Helen Keeley. I usually put just cinnamon sugar on the cookies, but at my ten-year-old’s request I’ve begun sprinkling colored sanding sugar on some of them. That’s not very authentic, but they look nice for the holidays. 1. In a large bowl, cream the butter and 1¼ cups of the sugar until light. Add the beaten egg and blend well. Gradually add the flour, mixing well. 2. Divide the dough into three or four flattened rounds, wrap the discs in plastic wrap, and refrigerate for at least four hours, and preferably overnight. 3. Let dough rest at room temperature for about 15-30 minutes, until just soft enough to roll. Meanwhile, preheat oven to 350°F and cover several baking sheets with parchment, or grease them with butter or vegetable shortening. 4. Flour rolling surface and pin well. Roll dough as thin as you can — preferably ⅛-inch thick or less. 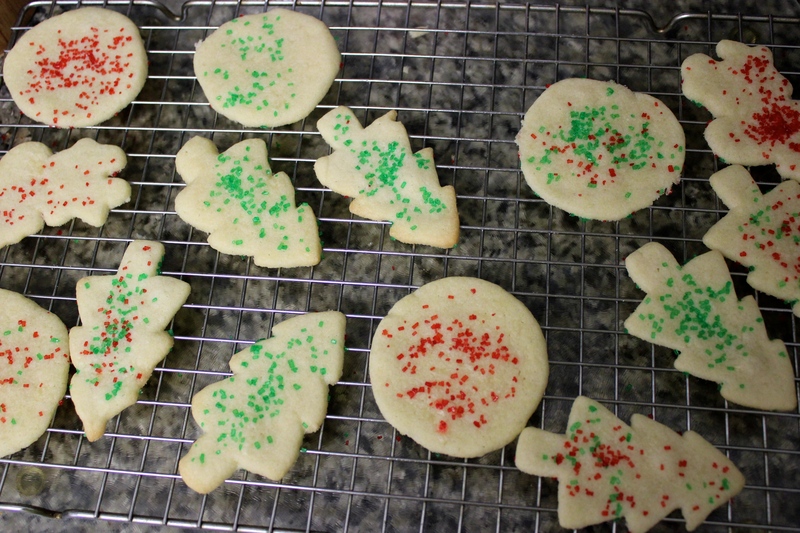 Cut shapes from dough with round cookie cutter or holiday shapes and transfer to baking sheets. 5. Mix the remaining ¼ cup sugar with the cinnamon. 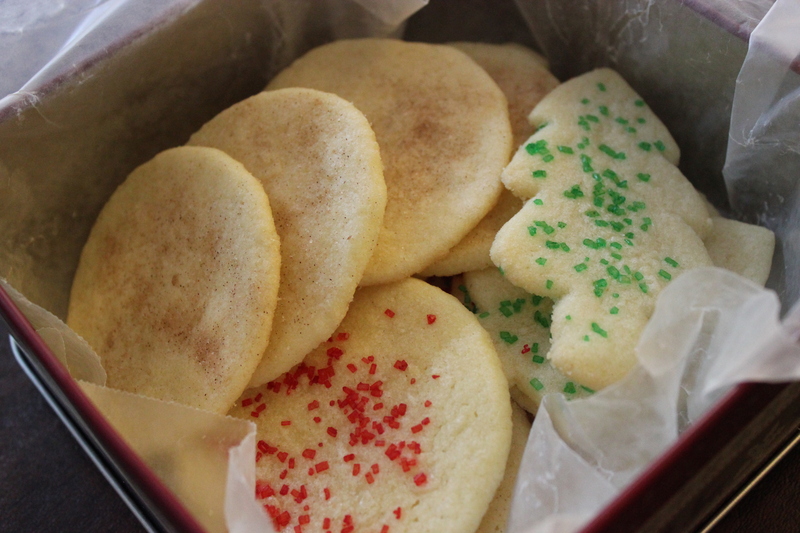 Sprinkle the cookies with cinnamon sugar, or with colored sugars. (If you’d like the sugar to stick well, beat an egg white with about a tablespoon of water and brush cookies lightly with the egg white before topping with sugar.) You can also press nut halves into the cookies if you wish. 6. Bake cookies for 5-7 minutes, until just golden around the edges. Watch them carefully as they burn easily! Remove from oven, let sit a minute or two, then transfer to wire racks to cool. Store in airtight containers. This entry was posted in cookies, dessert and tagged 19th century food, baking, Christmas cookies, cinnamon sugar, Fannie Farmer, food history, Pennsylvania Dutch baking, sable, Sarah Tyson Rorer, sugar cookies by revolutionarypie. Bookmark the permalink. Thank you! And Merry Christmas to you and yours. I remember these well from my own Pennsylvania Dutch grandmother. But, I’ve never made them. Thanks for the recipe. Merry Christmas! Hmmm. My assumption has always been that sand tarts are so named because the *cinnamon sugar* (no bright colors!) is, in fact, sand-like. I used to think this too, but the European sand tarts, which came first, had no cinnamon sugar decoration and still had the name. I wonder, though, if the topping was added because it looked like sand. The other mystery is why they were still called tarts even when tins weren’t used. Thanks for the lesson. I think we probably made the crescent shaped ones when I was growing up. These look delish! I’d like to try the Southern version someday. This seminar looks wonderful! Thanks so much for the link. Nice family history with a colorful update to the recipe. Mrs. Mac, thanks for bringing the seminar to everyone’s attention. I’m in Boston so I might be able to attend this! Happy holidays, everyone. Yum. These look so good. Enjoyed the backstory and personal connection to the cookies. I’ll have to try making these. :). Grandma would be so proud, and very pleased. Your sand tarts look very Christmasy! My grandmother and her sisters always made Sand Tarts at Christmas and were very particular when decorating. The Sand Tarts were rolled out very thin. After the cookie was baked and held up to the light, you could almost see through them. After my grandmother died, my mother, my sisters and I continued this tradition. This year my mother passed away, but my sisters and I will continue this tradition in their honor….plus our families would mutiny if there were no Sand Tarts for our Christmas gathering. I’m sorry about your mother, Cyndi. It’s wonderful that you plan to continue the sand tart tradition. And I know what you mean about the threat of family mutiny — I better get going on my sand tarts for this Christmas soon! Thanks for visiting.